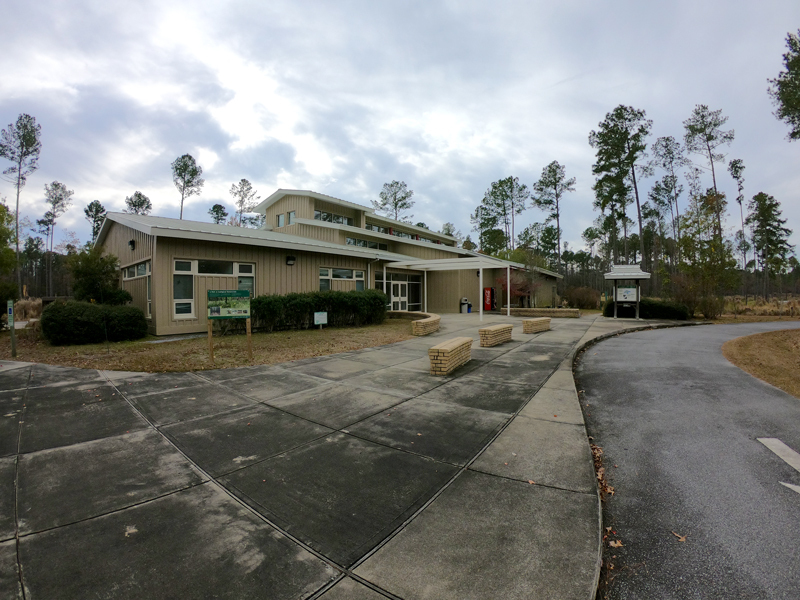 Hit hard by two hurricanes in 2018, you can still see some of the aftermath at Goose Creek State Park, but you have to look pretty hard to find it. The rangers and park maintenance crews have done a remarkable job of bringing the landscape back to life in such a short time. With the exception of a few damaged boardwalk trails and a scattering of downed trees along the shoreline, the park looked dramatic under a late November sky. 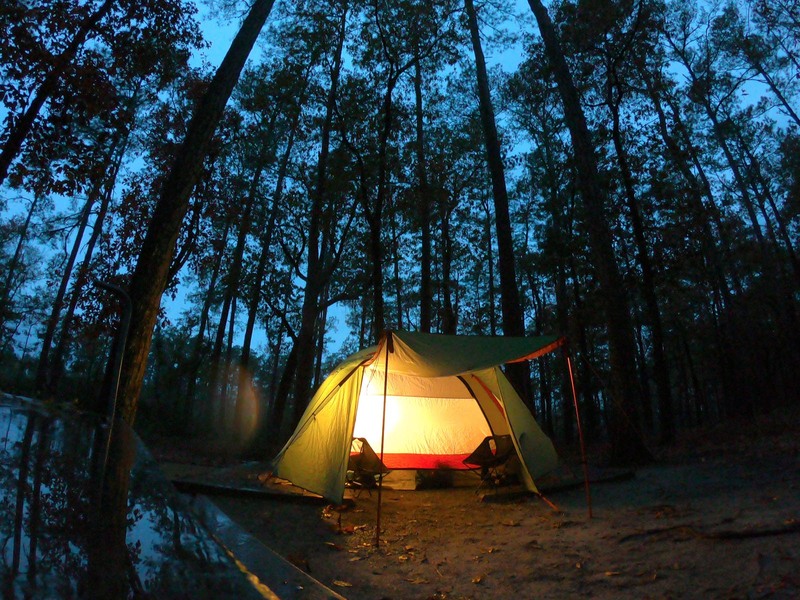 If you are not overly concerned about securing a riverfront campsite, then save yourself the reservation fee – at least in the off-season. 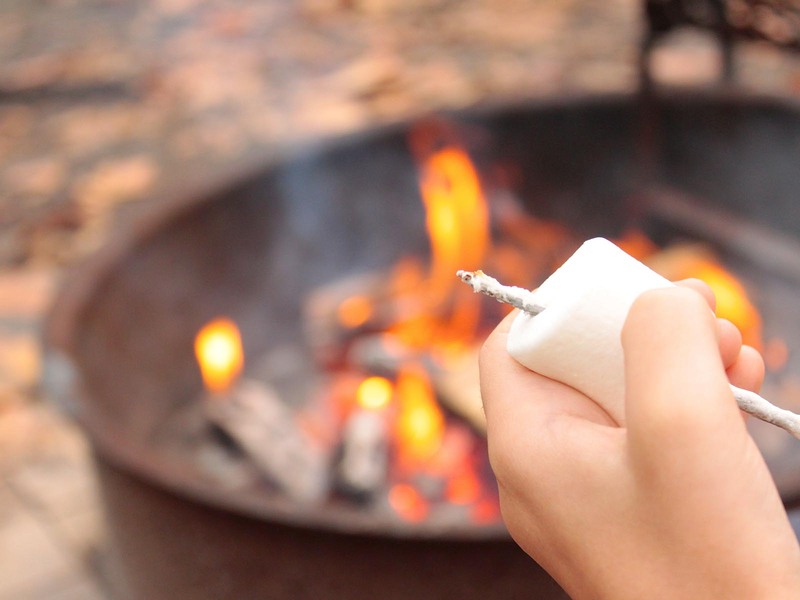 You'll hardly be settling for a lesser camp experience. What the inner sites give up in water access, they more than make up for in privacy. Most of the sites are set well back from the single track that winds itself gracefully through the park. You have to applaud the restraint that the park system displayed when they designed the campsites. 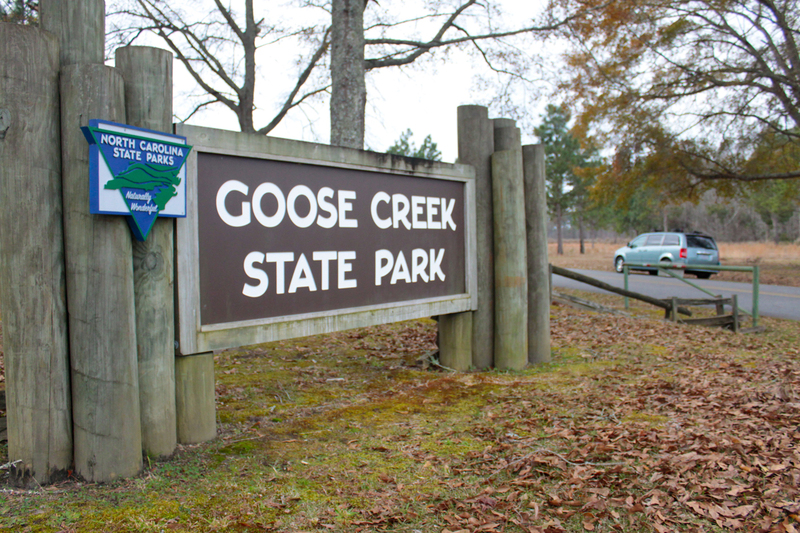 They could have easily tripled the number of sites and camping at Goose Creek State Park would still be a good frontcountry experience, but we're glad they didn't. Woodsheds are stock full of dry, manageable-sized logs. At $5 a milk crate, you really can't go wrong. Park rangers patrol at regular intervals and seem to run a tight ship. Although listed as a 'primitive' campground, the composting vault heads are about the cleanest looking – and smelling – we've ever experienced in a state park that they justify an in-copy shout-out, something normally relegated to the nota bene below. There is pleasure in the pathless woods, there is rapture in the lonely shore. 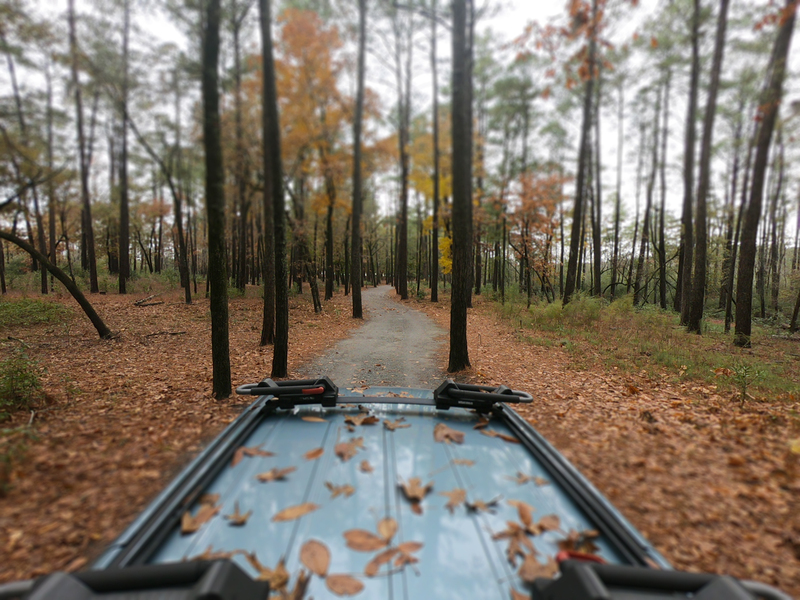 The park hosts a few trails that are unique and allow you to experience the coastal North Carolina plains from different perspectives – by foot and by paddle. 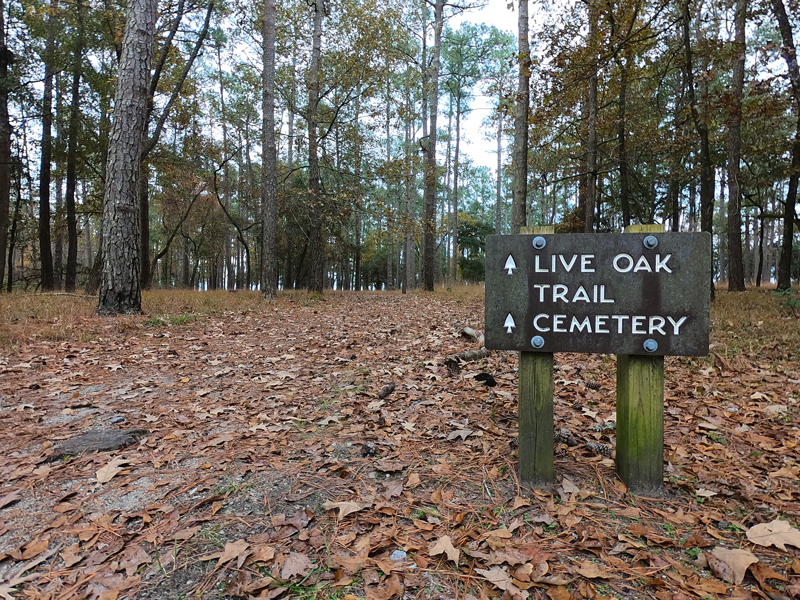 If you start at the parking lot and hike clockwise, the Live Oak Trail runs less than a half mile through a Spanish moss-covered oak forest and then follows along the shallow banks of the Pamlico River. As you get closer to the shoreline, you'll start seeing the unfortunate effects of hurricanes Florence and Michael which blew through the state. 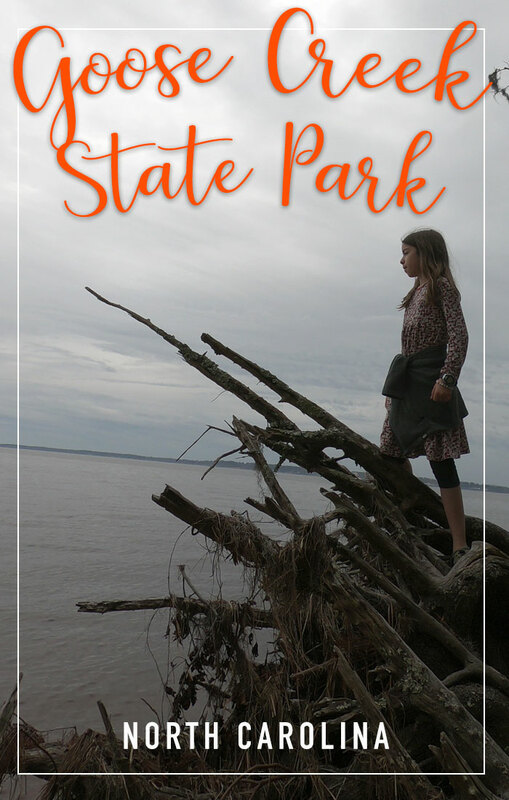 Several downed trees along the banks make for dramatic scenery and great climbing for the kids, but also serve as a somber reminder of the devastating power that these storms can pack. 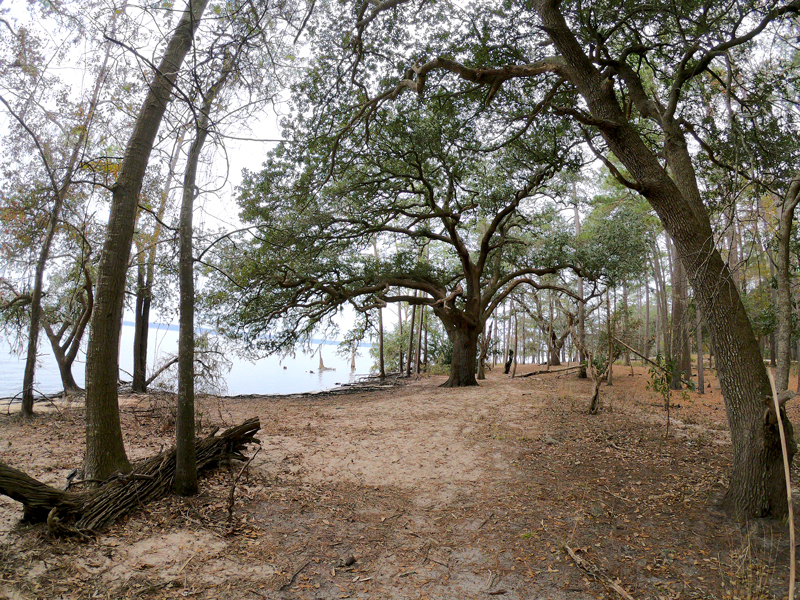 On a sunny day – even in the dead of winter in North Carolina – we would have packed in a lunch and enjoyed a respite on one of the south-facing beaches lining the lower half of Live Oak trail. 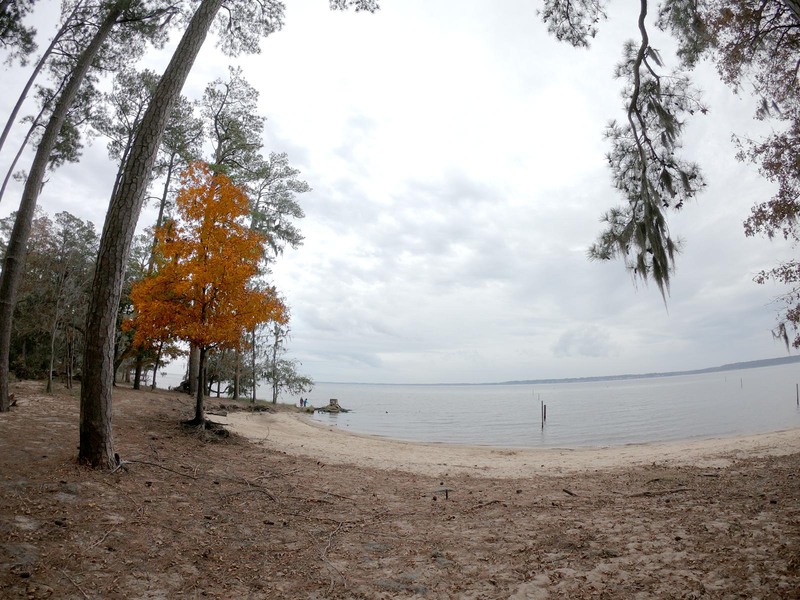 The Pamlico River – close to its sound – is tidal and brackish. The salty marsh supports sawgrass and black needlerush, creating a home for a number of avian species that you can knock off your life list: marsh wrens, heron, egret, rails, barred owls, and red-shouldered hawks to name but a few. The colder weather also attracts a different population of migratory critters including ruddy ducks, bufflehead, black ducks, and wood ducks plus the occasional tundra swan. If you are all set up, then bring along your kayak or canoe for a short paddle through 19th-century lumber history. 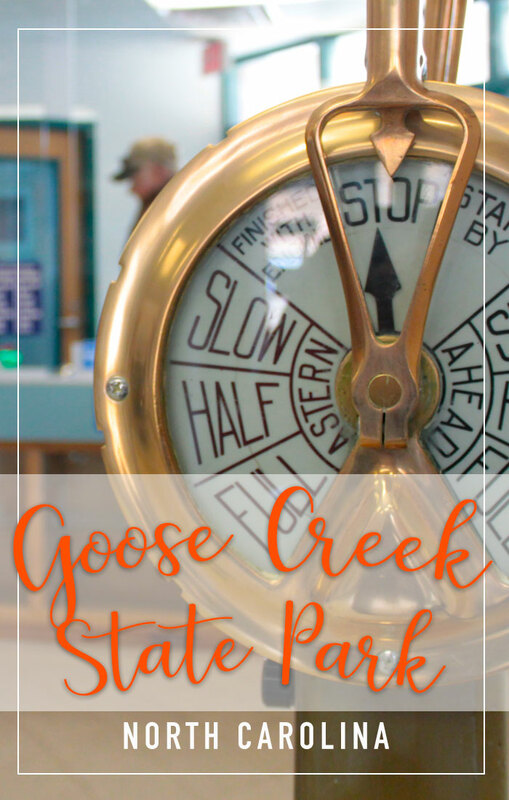 The three-mile Goose Creek Paddle Trail takes you through the waters that early loggers used to float timber to a sawmill in nearby Washington. Some of the historical remnants of the operation are still visible from the trail. 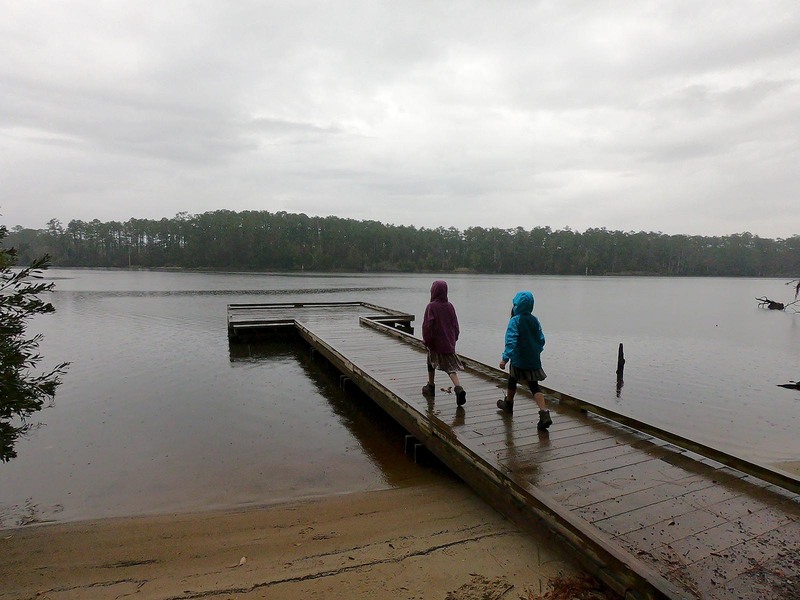 If you are camping at Goose Creek State Park, you can access the trail from a dock at the end of Campground Road. If you are a day-use visitor, then Dinah's Landing across the creek is the designated put-in. 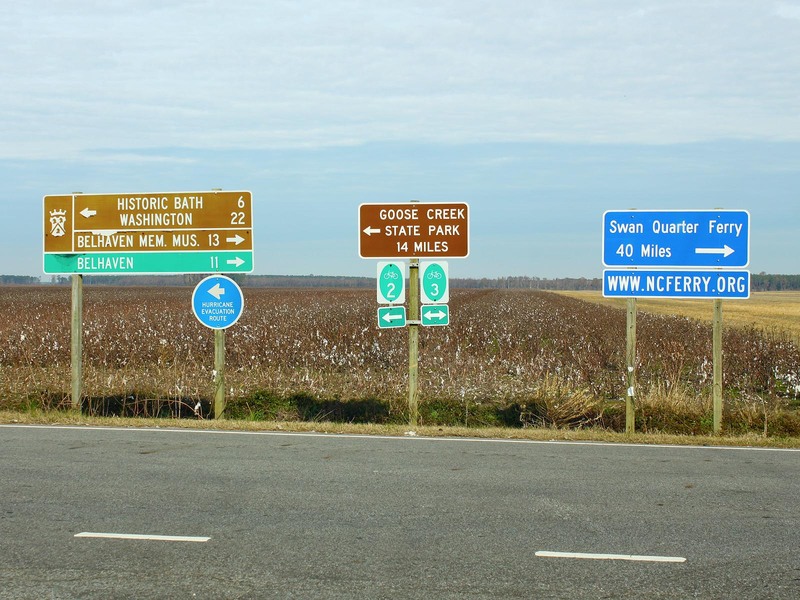 We could go into the complex geologic history of the fossil record surrounding Aurora, NC, but we will leave that to the folks who know about such things in detail. You can read about them here. The TL;DR version is that a few million years ago, the ocean covered what is now the North Carolina coastal plain. Thankfully, these ancient marine animals left behind their teeth, vertebrae, shells, and various other parts for you and me to spend hours digging through and being thoroughly fascinated by – but only if you take a little side trip to Aurora. 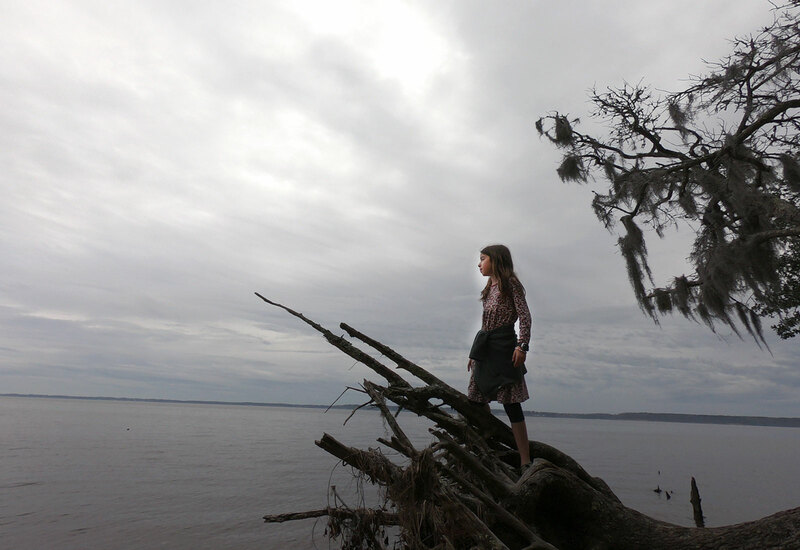 The nearby Nutrien Phosphate Mine –located a few miles down the road– periodically brings in truckloads of the sediment affectionately called "Pits of the Pungo," which contains thousands of fossilized delights. 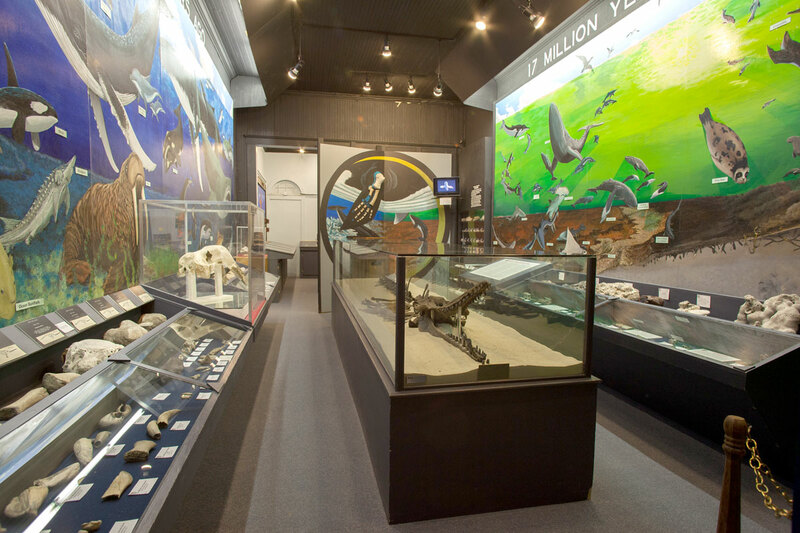 The Pits of the Pungo are open for digging from dawn to dusk, but if you want access to the exhibits and restroom, check the Aurora Fossil Museum for their hours. 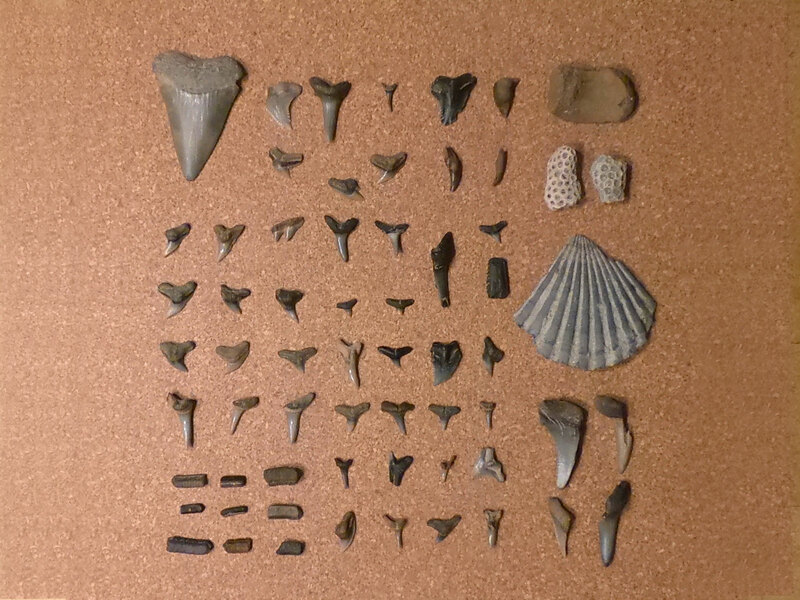 Honestly, if you spend an hour sifting through the pile and don't walk away with 15-20 fossil sharks' teeth we'd be surprised. Once you know what you're looking for, it's a breeze and fun for young and old alike. Bring your finds on over to the museum shop, and the knowledgeable friendly folks behind the counter will happily help you identify them. They also have available for purchase screens that are really helpful in separating the scree from the fossils. If you go in the heat of the summer, this charming downtown corner containing the fossil pit can be a pressure cooker. 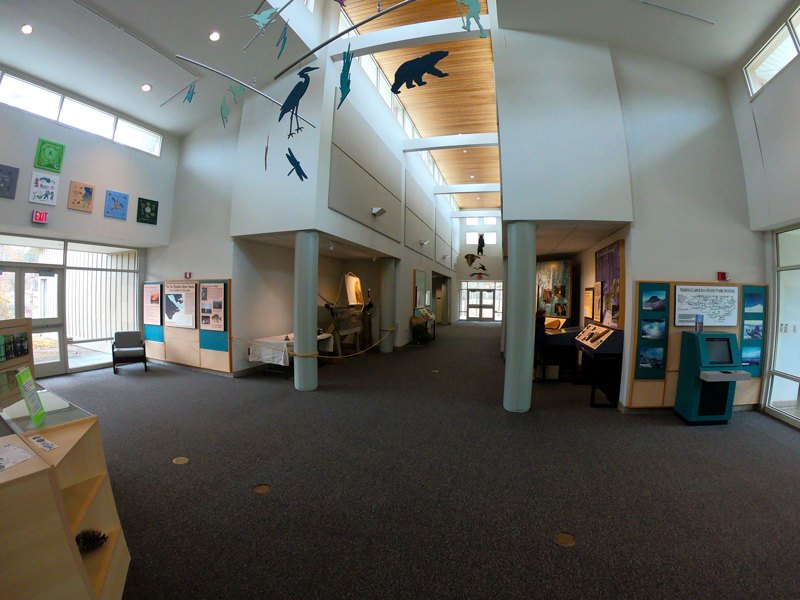 Arrive early while the sun is still low and then walk across the street to the air-conditioned comfort of the Aurora Fossil Museum and explore the learning center when the mercury gets too high. 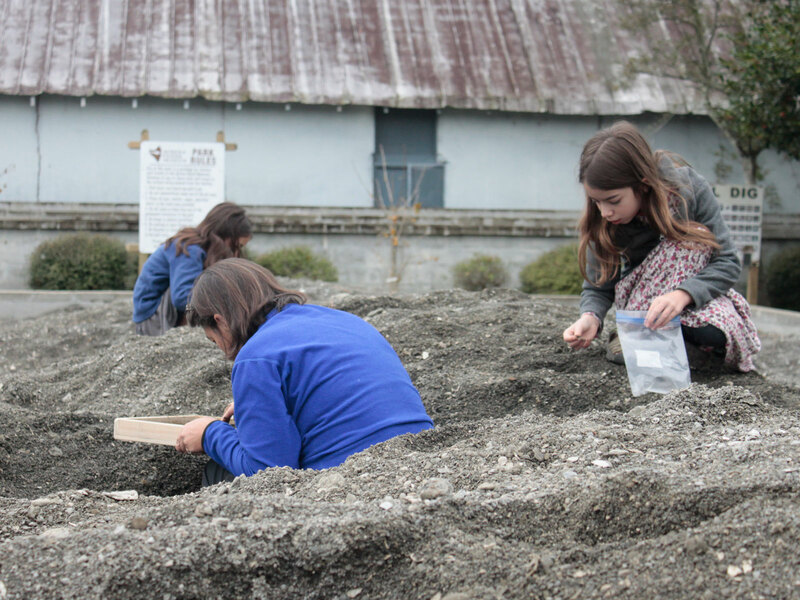 Don't rule out a mild autumn or winter day to enjoy the dig. 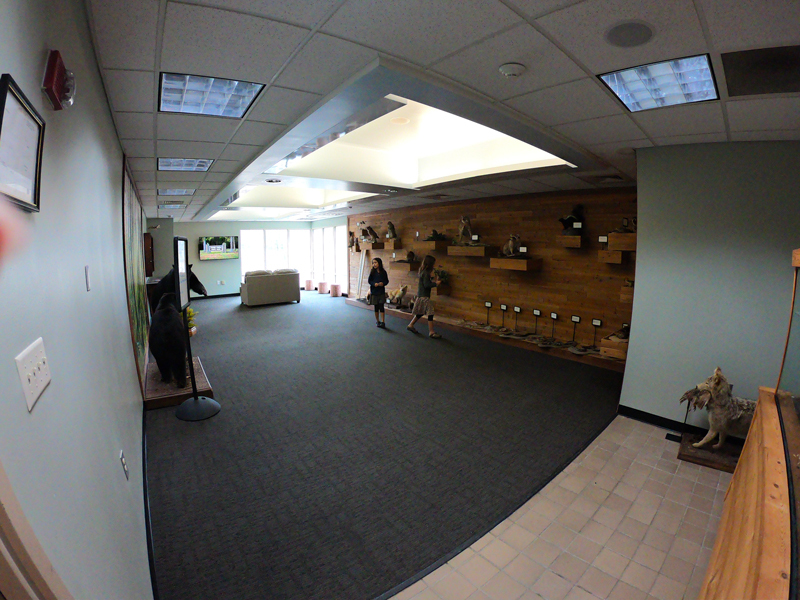 Fewer visitors in the off-season mean a run of the place for you and your fellow paleontologist. 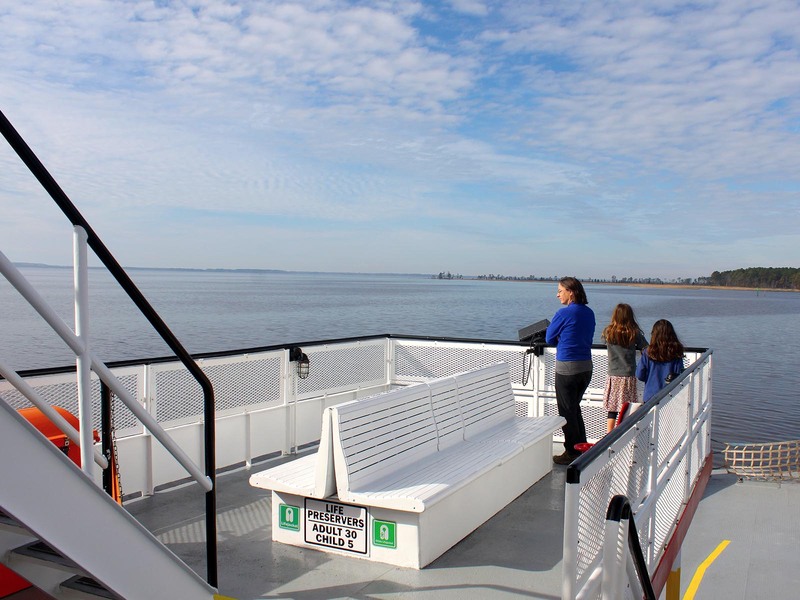 While not a necessary mode of transportation to get yourself to Goose Creek State Park from Aurora, if you've spent the morning digging for fossils at the Aurora Fossil Museum, then an easy 6.5 miles will get you to a free 30-minute ferry ride across the Pamlico Sound to Bayview, NC. Bonus - this short drive to the ferry station takes you past the Nutrien Phosphate Mine on either side of Highway 306. 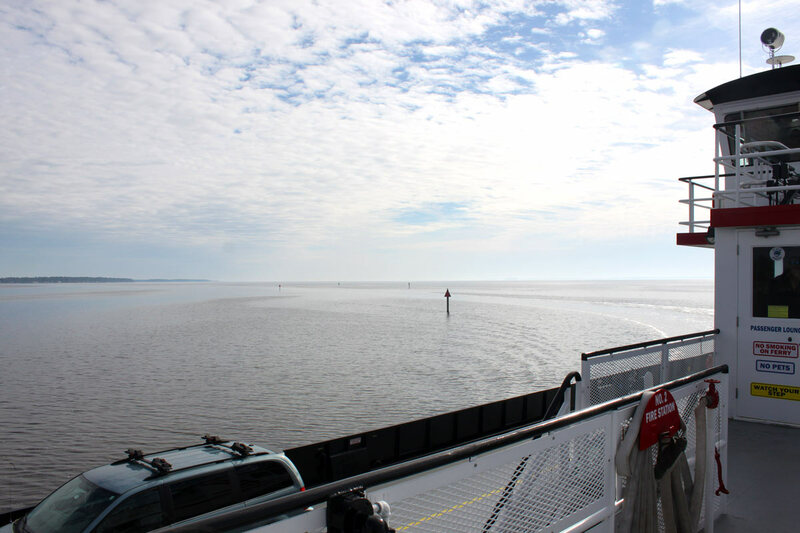 The gentle waters of the Pamlico and the low hum of the ferry diesels add to the charm of the experience. 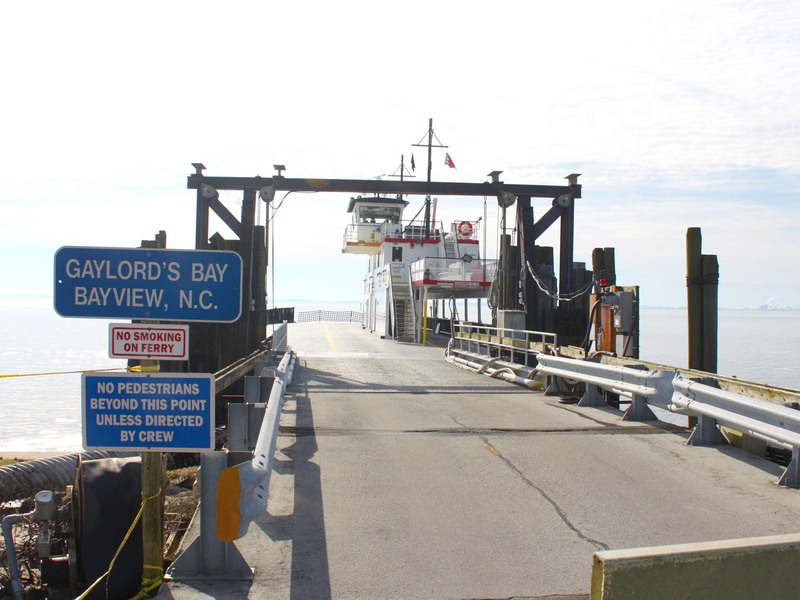 You can stay in your vehicle, watch from the ferry rail, or take the stairs up to the upper deck or indoor lounge for snacks and a game of rummy in one of the diner-like booths. 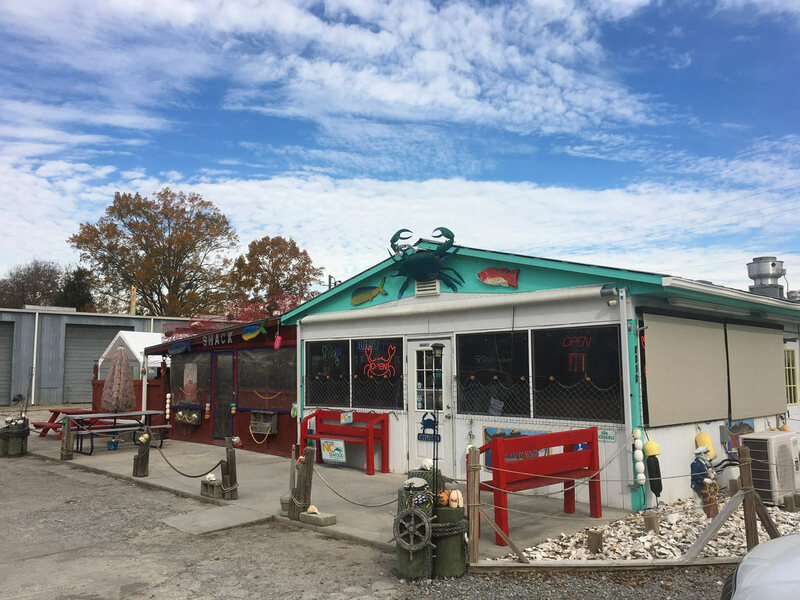 Naught but a 15-minute drive down Highway 264 from your camp at Goose Creek is a little place called the Washington Crab & Seafood Shack. While you might be tempted to drive the extra few miles into the waterfront district for some 'atmosphere,' do yourself a favor and resist. You'll be in great company --- by the looks of it, it's where the locals go for the best seafood in town. No need to get complicated. 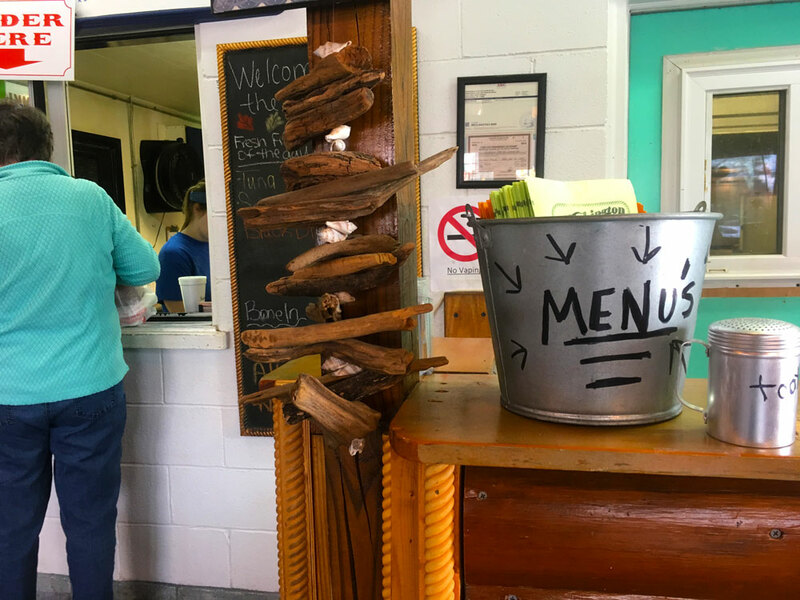 Just order up a basket of fried shrimp (cooked medium) at about a 1/2lb a person and a generous helping of the best hushpuppies you'll ever have. You'll leave swearing that you won't eat for a week, and at the time you'll mean it. When you eventually break camp, you'll find yourself drawn back to the place like a compass to magnetic north. No camphost but regular ranger patrol. While hiking stay alert for snakes, ticks, and bear. NOTE: Park gates are closed and locked at posted closing times for your protection. No exiting or entering the gates after the closing time.